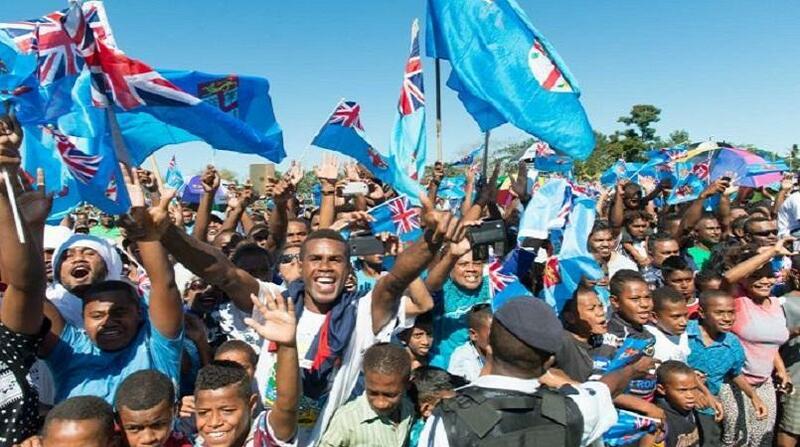 Large parts of Fiji have come to a standstill to mark the return of the victorious rugby sevens squad from Rio, where they won their country's first ever Olympic gold medal. Thousands of fans lined the flag-bedecked streets of Nadi on Sunday to catch a glimpse of their idols as the team made their way from the airport to an official welcome at a packed Prince Charles Park. The players, wearing their gold medals round their necks, were introduced to the ecstatic crowd as "the greatest rugby sevens team in the world". Fiji's 43-7 trouncing of Great Britain in the sevens final at Rio delivered the South Pacific island nation its first ever Olympic medal. "We won not because the boys were carrying the hopes of Fiji on their shoulders, but because the boys were on the shoulders of every Fijian," coach Ben Ryan declared. The team received a standing ovation when they arrived at Prince Charles Park, as the crowd packed into the 18,000 capacity stadium clapped, danced and sang. Captain Osea Kolinisau said he found the outpouring of emotion overwhelming, telling journalists: "We knew it was going to be crazy but not this crazy". Prime Minister Frank Bainimarama said it was a moment to be cherished forever and declared that Monday would be a national holiday where celebrations would continue. "As a nation we may be small but we are strong," Mr Bainimarama said. "We have limited resources but we are determined and unbeatable especially when we play effectively as a team." A full day of celebrations were expected to continue on Monday, starting with a ceremony at the country's national stadium in Suva. Fiji had been planning to make amends to its national flag to remove colonial symbols, but following the Olympic win last week, Mr Bainimarama said the decision would be held off. "While I remain convinced personally that we need to replace some of the flag's colonial symbols with a genuinely indigenous expression of our present and our future ... the flag should not be changed for the foreseeable future."